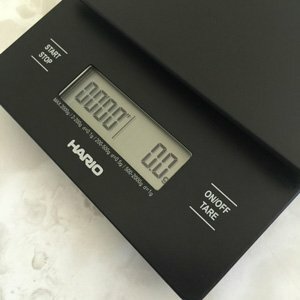 Hario V60 Drip Scale is the perfect digital scale for pour-over coffee brewing. 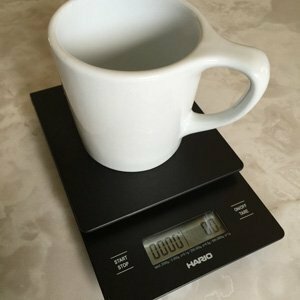 After going c heap and trying a standard kitchen scale it became apparent it was fairly useless for accurate pour-over coffee brewing. Why? The one we tested shut off after two minutes, the proper brew time for pour-over coffee is at least 3 minutes. The second issue is the lack of a timer. When brewing pour-over coffee you need to time the bloom and then the remaining pour. Hario V60 Drip Scale has a built-in timer which is pretty handy for the groggy mind in the wee hours. After unboxing you’ll find the unit compact and well designed. It was refreshing to see the controls simple and easy to press. The scale uses the metric system, measuring to the 1/10 of a gram if needed, an extra push of the ON/OFF TARE button was needed. Place your cup or carafe and Hario V60 Dripper with a moistened filter on the scale then press TARE button until it reads zero. Add freshly ground coffee to desired measurement, usually 24g. Press TARE again. Bloom coffee with 30-60g of hot water, start timer, bloom for around one minute. The add water in increments for 3 minutes totaling 385g. We thought the Hario V60 Drip Scale was a sharp-looking device. Kudos to Hario’s industrial design team and general aesthetic. 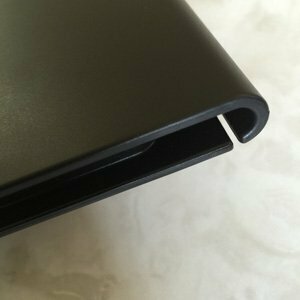 The construction is plastic and the finish is flat black. Stains will show, but wipe off easily. The unit is compact, light-weight and easy to handle. We found it felt a bit on the light side after using a heavier kitchen model. The display is a typical LED, no back light though, we don’t know if this is a problem, figuring that not many people brew pour-over coffee in the dark, but maybe people with vision issues will find it difficult to read. On the back is a wall hanging hole for wall storage. The plastic will scratch when finding the hook with hole, as we regrettably found out. So be careful. We are very happy with the Hario V60 Drip Scale, with only one regret: that we didn’t get one sooner! Pour-over Coffee World gives the Hario V60 Drip Scale 4 1/2 stars. Buy one now. A great Father’s Day gift idea.